Say hello to the updated version of the Lamborghini Huracan. Dubbed the Huracan Evo, the new version of the baby Lambo features sharper styling, more performante, new equipment and a couple of chassis updates. All in all, it appears to be madder and meaner than before, which is good news. On the outside, the design of the Huracan has Evo-lved with subtle but substantial changes. You’ll notice there’s a new front bumper with new air intakes, redesigned 20-inch alloy wheels and new side skirts. The rear-section has received some major design changes – the bumper is new, the diffuser is more pronounced and comes in body colour, while the number plate, exhaust pipes and spoiler have moved up. It’s a pretty badass looking thing! Powering the Huracan Evo is the same fire-breathing 5.2-litre naturally aspirated V10 engine, but the power and torque have gone up because this engine now runs the same spec as the Huracan Performante. Peak horsepower output, as a result, stands at 630bhp along with 600Nm of torque – an increase of 28bhp and 40Nm over the previous car. Power transmission duties are carried out by a seven-speed dual-clutch transmission that sends the drive to all four wheels. Lamborghini claims 0 –100km/h time of 2.9 seconds and a top speed of more than 325km/h. For extra grunt, the new model gets new rear-wheel steering system and four-wheel torque vectoring, along with Lamborghini Dinamica Veicolo Integrata (LDVI) CPU that allows the driver to change the dynamic characteristics of the vehicle. Lamborghini’s ANIMA controller continues to be offered with three driving modes – STRADA, SPORT and CORSA. Among other highlights, the interior of the Huracan Evo gets a heavy dose of Alcantara and leather, while there’s also a new 8.4-inch touchscreen infotainment system that features Apple CarPlay. There’s no word if Android Auto is available or not. But that's not going to be a deal breaker, right? 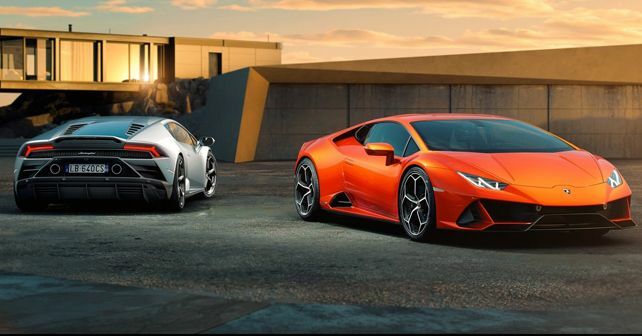 Lamborghini has announced the prices of the Huracan Evo in UK, USA, Japan, and China, so expect Lamborghini India to drop its pricing for the Indian market soon. And that, if we must guess, is surely going to be north of Rs 4 crore!